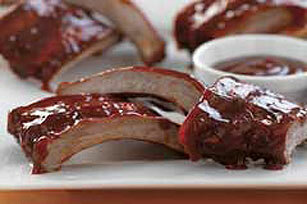 Try something different with our Orange BBQ Pork Ribs Recipe. The secret ingredient in our Orange BBQ Pork Ribs Recipe creates a great sweet-sour taste. Preheat grill to medium-low heat. Mix barbecue sauce and drink mix until well blended. Place half of the ribs each in single layer in center of sheet of heavy-duty aluminum foil. Spoon sauce mixture over ribs. Place packets on grate of grill; cover with lid. Grill 1 hour and 30 min. or until ribs are very tender. Remove from foil. Skim fat from sauce and serve with ribs. Serve with steamed vegetables and whole wheat bread. Preheat oven to 350°F. Place ribs in single layer in large roasting pan. Pour sauce mixture over ribs; cover tightly with foil. Bake 1 hour and 30 min. Remove foil; continue baking 15 min. or until ribs are tender. Skim fat from sauce and serve with ribs.